Fuchs Lubricants Australasia has today opened the doors of its brand-new purpose-built plant in Beresfield, a 25,000 square metre world-class facility that will support business growth and customer service. FUCHS has operated from a pre-existing site in Wickham, Newcastle, since 1979 and has been a major supplier of oil and lubricant products to customers in the mining, commercial transport, agricultural sectors in the local area. With a global strategy focussed on customers, Chairman of the FUCHS Group Stefan Fuchs said we are investing in new plants around the world as part of our commitment to be close to the customer. “Australia is an important market for FUCHS and this is why we have invested in the new plant at Beresfield,” Stefan Fuchs said. Managing Director of Fuchs Lubricants (Australasia) Wayne Hoiles said that many of our competitors are moving overseas and are operating under an import model, but that’s not our strategy. “We need to have local infrastructure that can handle the requirements of Australia and New Zealand, so we are investing in infrastructure to provide a better service to our customers,” Hoiles said. FUCHS is the only major lubricants company to still manufacture products in Australia, and while that means the company is perfectly positioned to respond to the immediate needs of its customer, particularly in emergency situations, it also means jobs for Australians. “We employ around 30 personnel in Newcastle, and as our company grows so will the employment opportunities for local residents, particularly in our warehouse and maintenance areas. Leading the operation of the new Beresfield facility is longtime employee and Deputy Managing Director of Fuchs Lubricants Australasia, Stewart Knight. Knight said it wasn’t often there was an opportunity to create a facility from scratch, so the company was meticulous in its planning. “We spent around seven years planning the design of the new building and conducting significant consultations with our global counterparts; then it took 18 months to complete the construction. “We looked closely at Fuchs’s other purpose-built plants such as Yingkou in China and Kaluga in Russia to create a facility that could truly meet our requirements,” Knight said. To ensure the plant has the capacity to grow with the business, Beresfield has been built in a two-stage process, and it is upgradable at multiple levels. Keeping in line with their core values, FUCHS’s new Bersefield plant features a host of environmental and sustainable features. The plant has also been built using high-quality materials and cutting-edge technology. The Beresfield plant was officially opened today by FUCHS’ Chairman Stefan Fuchs. Lee Holdsworth has claimed his best Qualifying result this year throughout a consistent weekend at the Winton SuperSprint for Round 5 of the Supercars Championship. • Holdsworth was leading in Practice 3 on old tyres. • Holdsworth qualified P7 for Race 10. 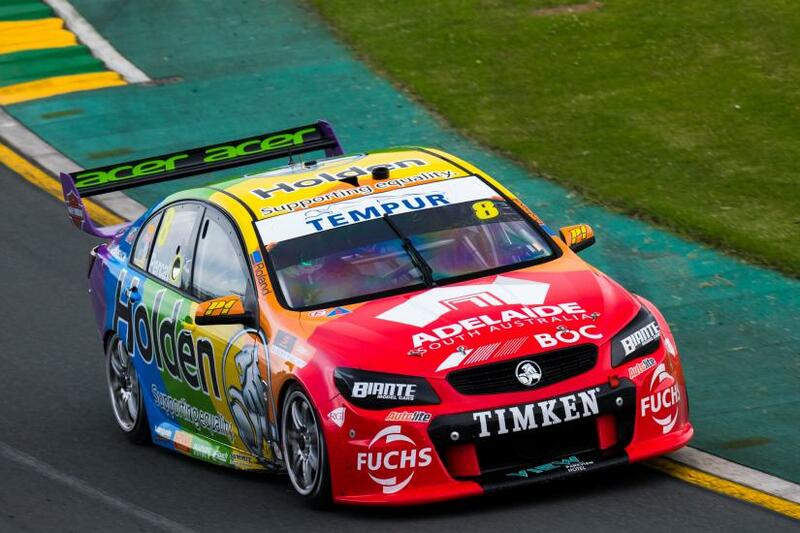 • Holdsworth's best Race Result for the weekend was P10. • Holdsworth jumped from 17th to 12th in the Championship Standings this weekend. Race 9 - Position 11 Holdsworth qualified P12 for Winton's first Race following two Top Ten finishes in the wet Practice Sessions. A great start to the Race saw Holdsworth climb into P10, but a hit from Tander on Turn 2 sent him off-track and he dropped two positions. Holdsworth was engaged in a highly-televised battle with Percat & Courtney for P10, which resulted in Courtney being sent into the gravel and Holdsworth finishing P11. Happy with the car speed, Holdsworth was satisfied with the team's result. Race 10 - Position 10 Holdsworth spent most of Race 10 Qualifying at the lower end of the field, but shot into 7th on his final Lap of the session marking the team's best Qualifying result this year. Getting a great start to the Race Holdsworth maintained his position inside the top ten, but lost time in a Pit Stop. Holdsworth fought with Davison and Mostert in the final laps of the Race and was able to push forward into P10. Overall Holdsworth was happy with a consistent weekend and is looking forward to continuing with the team's momentum in Darwin. "HAPPY WITH THE WEEKEND, IT WAS A CONSISTENT RUN. WITH 12TH IN QUALIFYING AND 11TH IN THE RACE ON THE FIRST DAY AND 7TH IN QUALIFYING ON SUNDAY AND 10TH IN THE RACE - WE HAVEN'T HAD THAT CONSISTENCY IN A COUPLE OF YEARS. SO OVERALL I'M SATISFIED, PROBABLY COST OURSELVES A FEW SPOTS IN PIT LANE BUT I THOUGHT THAT THE TEAM DID A FANTASTIC JOB OVER THE WEEKEND." Preston Hire Racing will now prepare for Round 6 of the Supercars Championship at the Darwin Triple Crown on June 16-18, with all Races to be televised LIVE on Fox Sports. 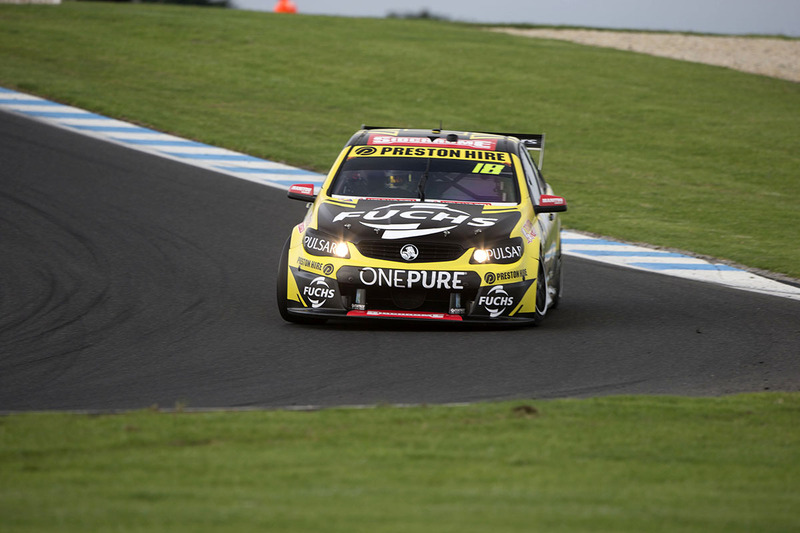 Lee Holdsworth has finished Race 6 at the Phillip Island 500 in P5, achieving Preston Hire Racing's best result yet in the Supercars Championship. • Holdsworth finished practice in P5 & P8. • Holdsworth finished P5 in Race 6. Race 1 - Position 22 - Holdsworth started Race 1 in P12, after just falling shy of the Top 10 in the first Qualifying session. On the opening lap, Holdsworth was pushed out wide to avoid a multi car incident and once on the grass he had little control, re-joining the race at the back of the pack. Holdsworth had to pit to clean out a fully clogged up radiator with mud and unfortunately lost 8 laps in the process. Holdsworth was able to complete the Race in P22 and was one of few cars that didn't blow a tyre. Race 2 - Position 5 Holdsworth qualified P15, and had a great start to the final race at Phillip Island. A series of strategic and effective Pit Stop calls by Grech helped Holdsworth advance to the front of the field. Holdsworth made his way up to P7 with 25 laps remaining, and in the final 5 laps he moved again into P5. Holding onto his position until the final Lap, Holdsworth finished 10 places ahead of where he began. Holdsworth was ecstatic to deliver Team Eighteen's best result yet with a P5 finish. "OVER THE MOON FOR THE TEAM, FOR ALL OUR SPONSORS AND FOR MYSELF. WE ALL NEEDED THIS, OUR PERSISTENCE HAS PAID OFF." Preston Hire Racing will now prepare for Round 4 of the Supercars Championship at the Perth SuperSprint on May 05-07, with all Races to be televised LIVE on Fox Sports. 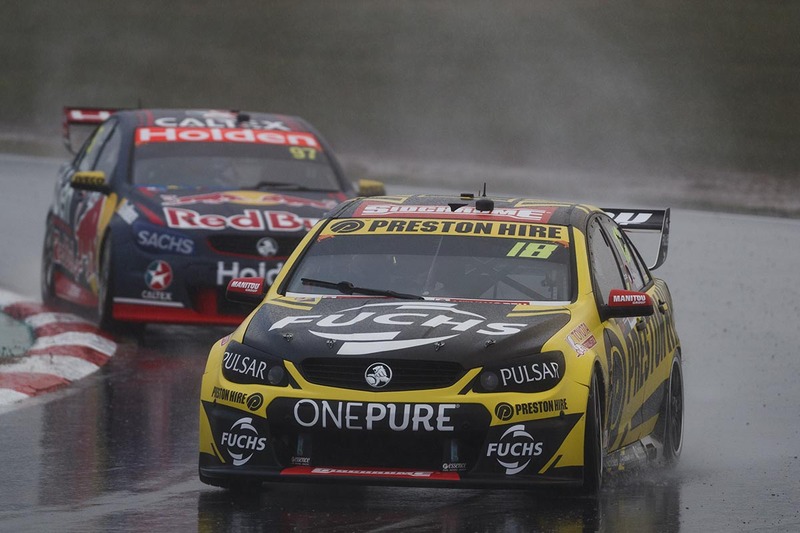 Preston Hire Racing has fought against the elements for Round 2 of the Supercars Championship at the Tasmania SuperSprint. Race 1 - Position 11 Holdsworth started Race 1 in P20, after a tough Qualifying session saw him start at the back of the grid. Hitting the track in the rain, Holdsworth saw the trouble up ahead on the second lap and dodged drivers from infront and behind before slowing down to miss the drama. Holdsworth was the one of the only drivers that managed to avoid the 12-car pileup as it happened, and navigated his way through the smash as the safety car came out. The Race was suspended for over half an hour while the debris and cars were cleared and two more laps were completed under safety car, and Holdsworth finished P11. Supercars declared the race non-for points later in the night. Race 2 - Position 17 After a full night and day of rain at Symmons Plains Holdsworth qualified in P11, which is where he remained for the majority of the race. Following a series of tight battles, Holdsworth was pushed out wide by Todd Kelly in a great passing move and unfortunately locked his tyres in the wet conditions which sent him into the gravel trap. The safety car was activated but Holdsworth was able to rejoin the race three laps down to finish P17. "OVERALL IT WAS A VERY STRANGE WEEKEND. WE SHOWED SOME CAR SPEED THAT WE BACKED UP FROM THE AGP WHICH IS PROMISING. WE ARE STILL 15TH IN THE POINTS AND LOOKING FORWARD TO CARRYING SOME SPEED TO PHILLIP ISLAND AND HAVING A NICE DRY RUN." 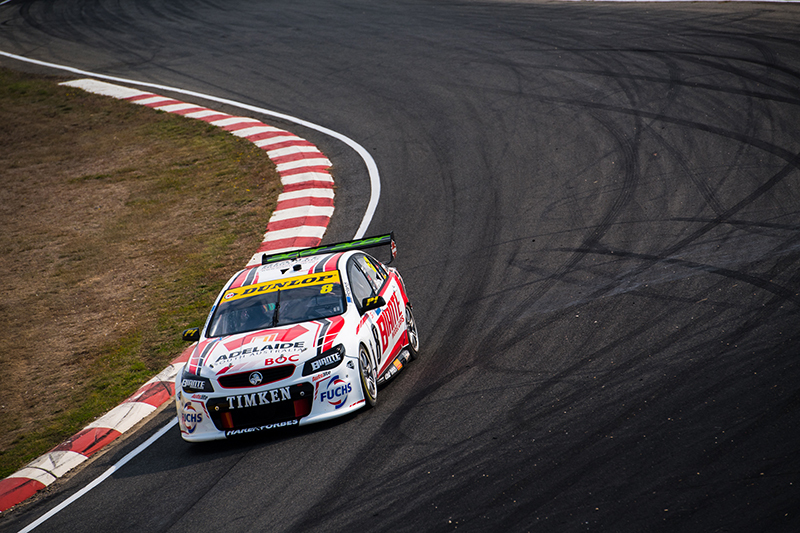 A stellar effort from the Brad Jones Racing team saw Nick’s car repaired at 3am Sunday morning, and ready to take on the final days racing at Tasmania. Qualifying for the 200km race was delayed with the rain and as it eased slightly, cars took to the track. Nick was in the top 5 for most of the qualifying session, but with a slight change made towards the end of the session it wasn’t enough to keep Nick up the top and he qualified in 16th position. Nick had a good start to the race showing great pace. When it looked like an early safety car was going to be called the team were quick to call Nick into the pits and work their strategy to push Nick forward further. The team had Nick in a reasonable position, and with more cars making off track excursions, plenty of safety cars appeared and Nick was working his way through the field via attrition and through his speedy pace. He finished the race in 11th. After yesterday’s carnage at Symmons Plains, a huge effort was put in by the team at Freightliner Racing to get Tim Slades’ car repaired for today’s final day of racing. Not all teams were as lucky, with 4 of the 11 cars unable to compete today. 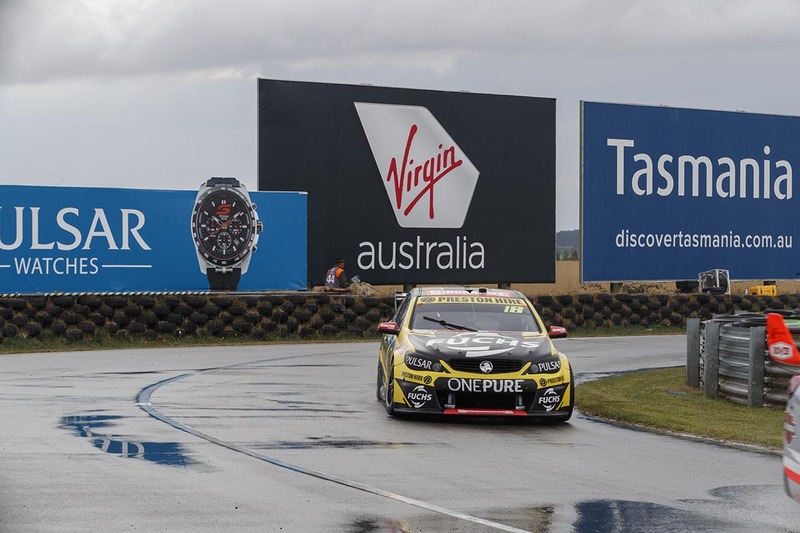 Rain set in for the day at Symmons Plains, yet Tim was confident the car would perform in the trying conditions. That it did and he qualified in 4th, putting him on the second row for the start of today’s 200km race. The race was filled with safety cars due to a number of off track excursions by drivers; even though the rain had eased, if a driver found themselves just off that dry racing line, havoc followed! The race was shortened because of this, and Tim finished in 8th position. 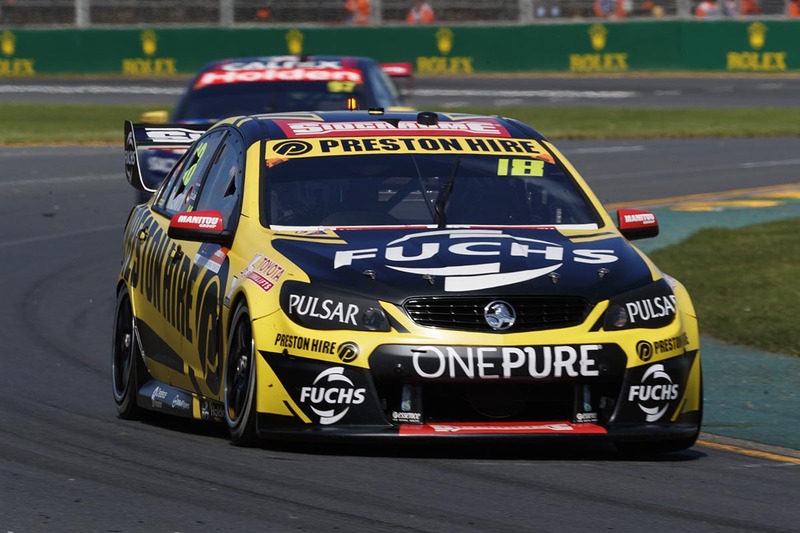 Preston Hire Racing’s Lee Holdsworth is looking to harness the race speed displayed at the Formula 1 Australian Grand Prix at the upcoming Tasmania SuperSprint. Preston Hire Racing had incredible race speed at the Formula 1 Grand Prix, when Holdsworth climbed 15 places in less than 10 Laps before he was taken out by Percat's car with a brake failure. 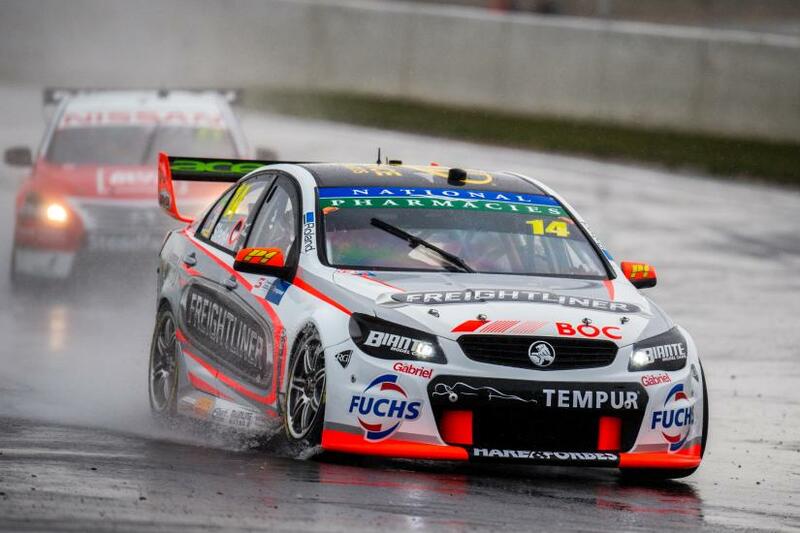 The Preston Hire Racing Team worked throughout the weekend to repair the car in time for the Tasmania SuperSprint. Holdsworth walked away injury free from the crash and has directed all of his focus towards harnessing the same speed displayed at the AGP. The team is specifically working towards improving Qualifying times to get Holdsworth at the front of the field in this coming weekend's races. Schwerkolt is confident in his team, who made a breakthrough in the delivery of car speed in Melbourne. Symmons Plains was one of Preston Hire Racing's best rounds in the Supercars Championship in 2016 and Schwerkolt is hoping to replicate some good results in Tasmania. Holdsworth and the Preston Hire Racing Team are prepared for the Tasmania SuperSprint on April 7 to 9, with all races to be televised LIVE on Fox Sports. Holdsworth started Race 1 in P26, after an engine issue in Qualifying ruled the #18 Car out of the sessions. An incredible effort from Holdsworth saw him reach P11 in less than 10 Laps, before he was made an innocent bystander and shunted from behind by Percat. Percat’s brakes failed on the Turn 1 entry and collected Holdsworth’s right rear corner. Holdsworth was on track for a Top 10 finish and believes the team had made a series of improvements over their two days at the track. 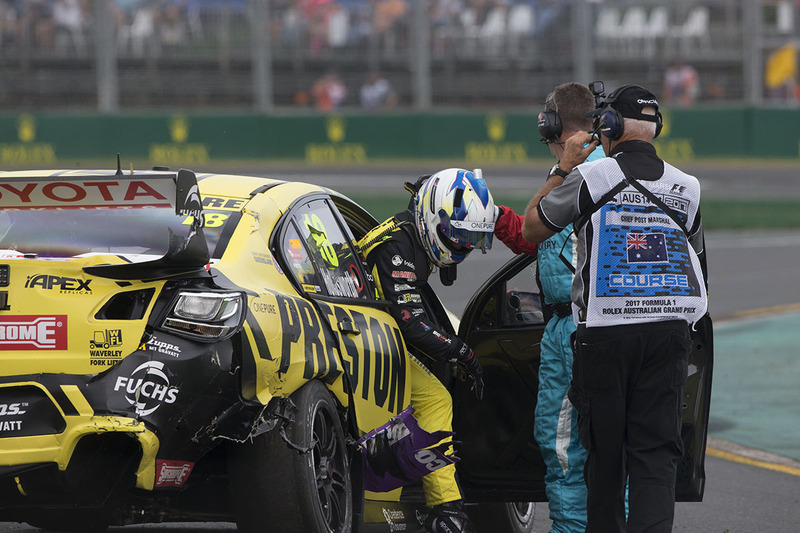 Due to the damage to the Preston Hire Racing Car, Holdsworth was unable to begin Friday’s second race. The Car was transported to the Mount Waverley Workshop for repairs before the Race where the Team will work throughout the night in hopes Holdsworth can rejoin Saturday to Sunday’s race. Schwerkolt believes his team has the skill to make the repair happen before Sunday and that they can return to develop on what was an incredibly fast race car. Change on the Supervisory Board of FUCHS PETROLUB SE: End of an era – Dr. Manfred Fuchs to step down after Annual General Meeting Dr. Manfred Fuchs (78) is to step down after 13 years as Deputy Chairman of the Supervisory Board at the end of the FUCHS Annual General Meeting on May 5, 2017. The Supervisory Board’s nomination for his successor is Dr. Susanne Fuchs (52), who will introduce herself to shareholders at this year’s Annual General Meeting. Dr. Susanne Fuchs, who belongs to the third generation of the entrepreneurial family, holds a doctorate in veterinary medicine and successfully completed her MBA at the Open University in the UK in 2016. Dr. Manfred Fuchs took responsibility for the lubricants company founded in 1931 early on. He succeeded his father and company founder Rudolf Fuchs in 1963, at the age of 24. The development of FUCHS to a global player, strong growth primarily through acquisitions, early entry into growth markets such as China, the creation and integration of a group with global operations and the IPO in 1985 were just some of the important milestones in his 41 years as Chairman of the Executive Board at FUCHS PETROLUB. At the end of 2003, Dr. Manfred Fuchs retired as Chairman of the Executive Board and joined the Supervisory Board of FUCHS PETROLUB as Deputy Chairman. He was succeeded in 2004 by his son Stefan Fuchs, who has been Chairman of the Executive Board ever since. After 41 years at the head of the company and 13 years of activity on the Supervisory Board, an era is now coming to an end. As Managing Director of the family company RUDOLF FUCHS, in which the family’s shares are pooled, he will continue to follow the development of FUCHS PETROLUB with great interest. In recognition and appreciation of his outstanding achievements as Executive Board member, Supervisory Board member and anchor shareholder of FUCHS PETROLUB over more than five decades, the Supervisory Board appoints Dr. Manfred Fuchs as Honorary Chairman of the Supervisory Board. “On behalf of the Supervisory Board and the Executive Board, we give Dr. Manfred Fuchs our warmest thanks for his extraordinary entrepreneurial performance and successful Supervisory Board work. Dr. Manfred Fuchs actively shaped and supported the development of the company with his outstanding personality and his great wealth of business experience. We wish him all the best for the future and continued good health,” says Dr. Jürgen Hambrecht, Chairman of the Supervisory Board.